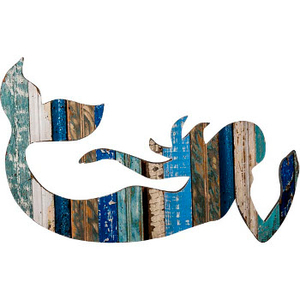 Add this Swimming Mermaid to your coastal wall and make a big splash! This dazzling sea creature, the lovely mermaid with eye-catching mermaid tail makes the perfect coastal decorative accent. 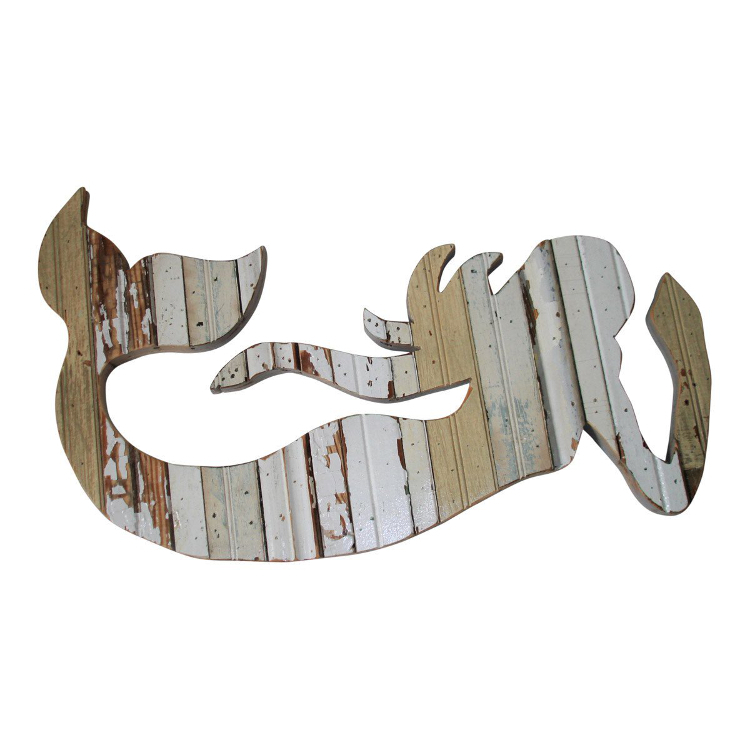 This beautiful mermaid is wonderfully rustic, with all of the natural wood grain and imperfections adding to the patina. Upcycled from re-purposed barn wood in ocean colors of blue . This is a totally unique artistic wall decor art piece with no two being the same. Check out the coordinating Crab Wooden Wall Plaque, Lobster Wooden Wall Plaque, Shark Wooden Wall Plaque, Anchor Wooden Wall Plaque, Octopus Wooden Plaque and Pelican Wooden Wall Decor. All are sold separately and can complete a coastal wall theme. All Wooden Plaques are environmentally friendly. The wire hanger on the back is also recycled, and makes hanging simple. Mermaid are beautiful, fascinating and mysterious! Images of these sea dwellers are found in coastal homes throughout the world. Now is your chance to have a permanent guest in your coastal home decor! Our Mermaid wall art is made from reclaimed barn wood from the southeast USA. Appearance is distressed which gives them a salty, aged look. Small cracks, knots and imperfections are all part of the allure!